Last summer my bell peppers were sad due to the failed "Pillar of Peppers" experiment, but this year they have been growing large and fleshy and great for stuffing. We've already have two dinners with plenty leftovers, and it looks like we will get to have them again tonight! Last summer I posted a recipe for Three Cheese Stuffed Peppers which used bread crumbs and mushrooms, but this summer I have been enjoying using Mahatma Saffron Yellow Rice. This recipe tastes lighter and fresher but still delicious. Prepare the rice according to the directions on the package. Brown the ground beef and onions in a skillet and add the diced tomatoes and continue to head for a few minutes. In a bowl, mix together the rice, beef, feta, salt and pepper. Wash the peppers, slice open lengthwise and remove the seeds. Boil for 5 minutes with the lid on and remove and place in the casserole dish. Spoon the stuffing into each pepper and top with the shredded cheese. Bake at 350F for 20 minutes or until the cheese bubbles. That looks amazing!! I'll have to try but probably with store-bought peppers. 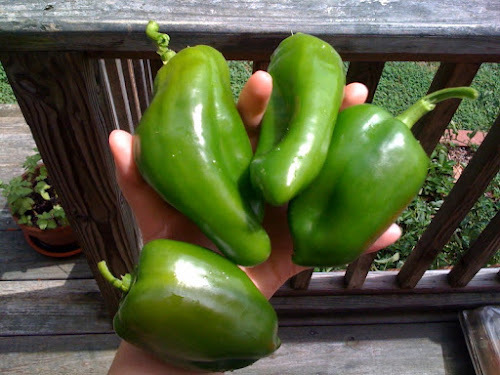 My pepper plants routinely only produce one pepper per plant (if that) except for hot peppers which go like gang-busters and leave me with piles of jalepenos! !